Helm: This movie was well made, exciting and...cool. Mathew: Don't get all weak in the...uhm...helmet, Helm. It was good, I readily admit that, but it was also kind of derivative. Helm: It was good. End of story. Mathew: Look, Helm, you're only saying that because you haven't ever seen E.T. or Close Encounters. 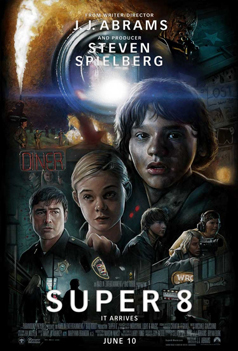 J.J. Abrams is a great director, but he should get away from Steven Spielberg while he still has some originality left. Helm: I have not seen those other films, that is true, but that does not change how intense the train crash sequence was, how well paced the action was, how well crafted the themes of the film were, or how amusing the child actors were in their roles. Mathew: Okay. Don't get me started on the kids. The boy is like, a dead ringer for Elliot (Henry Thomas) and the girl is a dead ringer for Gertie (Drew Barrymore) from E.T. It was kind of weird, and I couldn't stop thinking about it, which took me out of the film several times. Helm: I wish the usher had taken you out of the film. Just once, at the beginning would have been enough. Mathew: I'm just saying that it kind of felt like J.J. Abrams making a Spielberg hero worship film or something. And the whole thing with the dad of the main kid and the dad of the girl...and the whole thing with the locket...I don't know, it felt a little contrived in a heartstring yanking way. Mathew: Started to get a little weepy there, did you, Helm? Helm: HOLD THY TONGUE, VARLET! Mathew: Hey, no need to get testy. Helm: You are one to talk, Mathew. You shrieked like a woman more than once during the film. On my oath, you nearly scrambled up the back of your chair during more than one scene. The poor old woman behind you was in serious danger of being crushed. Mathew: Look. I'll admit that the movie had some pretty intense thrills and scares. But I never screamed. That was Jill. Helm: I would not have blamed her for screaming when you were squeezing her hand so tight you nearly broke her fingers. But she is made of sterner stuff than you. No, the screams were yours. Mathew: That was her squeezing me, dude. Helm: Enough! Let us rate the film! Helm: Churlish pinchfist! Only three? The train crash alone was worth five! Or what about the opening shot? So well crafted! Mathew: That was a great opening shot. But I'm telling you, dude, you haven't seen enough Spielberg movies to understand how this movie isn't as good as it is. Helm: It isn't as good as it is? You are an idiot.